Sappi's new head quarters situated at Cnr. 14 th Avenue & Oxford Road. 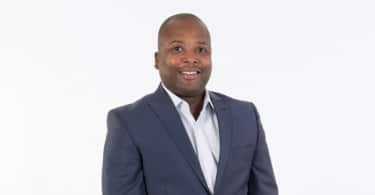 Sappi, one of South Africa’s oldest global companies, has moved its global and regional headquarters to a new site on the corner of Oxford and 14 th Avenue in Rosebank. The company is the sole tenant of the 4500m² Barrow Properties’ development, which will ultimately form part of the greater Oxford & Glenhove Precinct. Just over 200 Sappi staff members have made the building their new home. Andre Oberholzer, Group Head Corporate Affairs at Sappi, explains that the building met all of the organisation’s requirements for premises that not only provides a conducive environment for employees; but which is also well appointed and has a minimal footprint in terms of energy consumption. “Sappi had been headquartered in Braamfontein for many years but, following a restructuring exercise, the premises no longer suited us. We decided to look for a fit-for-purpose building that would offer employees convenience in terms of accessibility and location,” Oberholzer comments. Situated at the nearby juncture of two of Rosebank’s key routes, Oxford Road and Glenhove Road, the new premises certainly fit this criterion. Oberholzer reveals that this location provides a central point for Sappi’s staff, whose homes are evenly spread between Johannesburg’s northern, southern, eastern and western suburbs. Moreover, with on ramps and off ramps to the M1 and N1 motorways just kilometres away, commuting is easy; and, for those who prefer not to drive, the Gautrain station is within walking distance. The proximity of this facility was, in fact, another major consideration when the organisation settled on Rosebank as its new home, as it is easy for workers attending out of town meetings to catch the train to the airport. Meanwhile, for those flying in to Johannesburg, there are a plethora of accommodation options nearby. 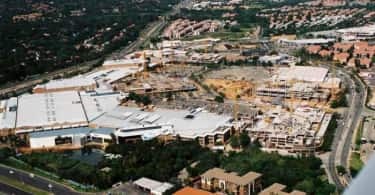 The abundance of shops at centres like The Zone and The Mall were another deciding factor, giving staff members plenty of options when it comes to picking a restaurant during their lunch break, or even consulting a doctor or dentist at short notice. “Being the sole tenants of this building, yet remaining a part of the new Oxford & Glenhove precinct, is a plus – particularly since we are now also part of the larger Rosebank precinct,” Oberholzer says. He notes that cnr 14 th Avenue & Oxford Road boasts many advantages making it the perfect choice for Sappi’s new location. “For a start, we have enjoyed a good relationship with the developers, Barrow Properties, from the outset. Because we had decided to come on board while the property was still in its base build stage, we were able to request specific features to ensure it was well suited to our requirements.” These features include the use of white porcelain, rather than plaster and paint, on the building’s exterior, and double glazing on the façade facing Oxford Road. Sappi also opted to change the size of the foyer so that it became twice the size that was originally planned, and extended balcony portals well above the roof to give the building the illusion of greater height. 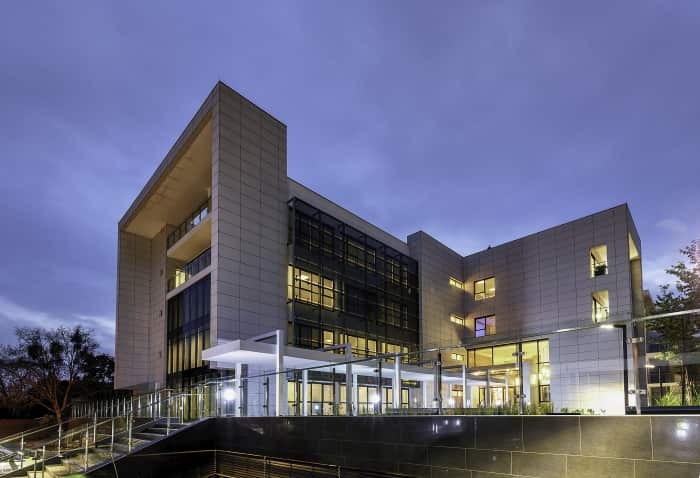 To ensure the safety of all employees, all glass balustrades were installed at a height of 1.2m to 1.5m (an increase on the 1m originally planned). Indigenous landscaping (which can be cared for with harvested rainwater) was introduced, along with an extended fountain at the building’s ground floor and entrance. Finally, plans for a structural column on the second floor were scrapped in order to accommodate the company’s boardroom. Several other features were requested to ensure that the company is able to obtain a high green-star rating; important because, as Oberholzer points out, as a provider of sustainable resources, a green ethos speaks to the company’s core. Thus, solar panels have been installed on the roof, providing a large amount of the building’s energy requirement. Added to this, all furnishings have been sourced from local manufacturers. Oberholzer observes that great care was taken to ensure that the building is comfortable and user-friendly. The company referenced modern corporate trends when designing the interior, taking into account the fact that today’s employees are unlikely to spend their entire working day at their desks. The premises’ internal structure therefore includes informal seating, private focus rooms, breakaway areas where teams can collaborate, and meetings rooms of various sizes where employees can also digitally interact with offsite colleagues. Sappi has made provision for the various types of transport used by workers to reach their office: for instance, there is space for 177 cars, while those who have bicycled in to work can have a quick shower, using facilities on the premises, before clocking in. “This move is about more than simply finding the right premises. Coming as it does at a time when we are shifting our focus to high growth areas, it’s also an indication of our confidence in the future,” Oberholzer concludes.